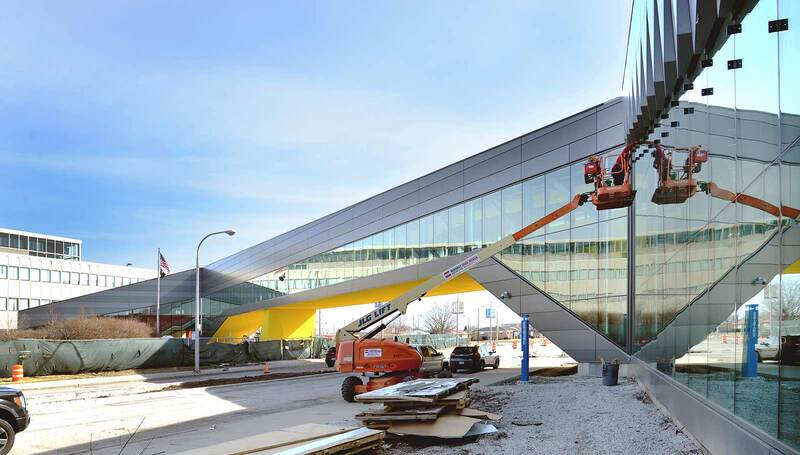 JGMA’s design strategy for Daley College’s Manufacturing, Technology and Engineering Center (MTEC) utilizes building transparency to showcase machines, equipment, and products integral to the learning objectives of the colleges as well as provide a visual connection to the surrounding West Lawn community. 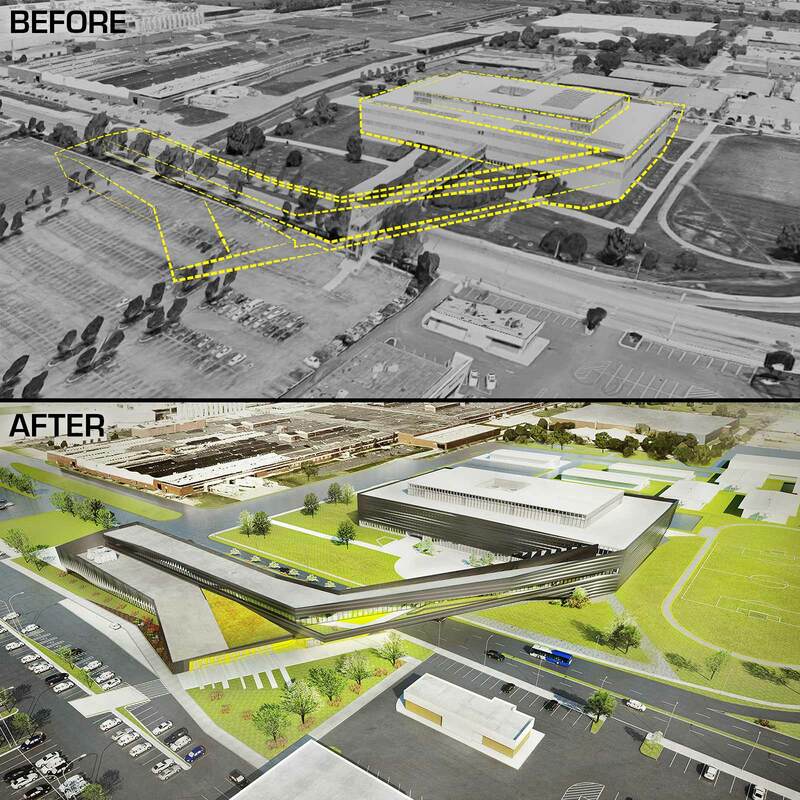 The seamless fluidity to the building’s form was inspired by the constant and linear flow of the manufacturing process. The building spans the main thoroughfare of 76th Street with a strong industrial bridge that links the south and north campus of Daley College. The new building celebrates the manufacturing industry through the expression of materials such as metal panels, glass, and exposed steel. In addition, the underside of the bridge has been intentionally painted caution yellow which is commonly seen in manufacturing. The procession under the bridge leads students through a landscape which merges with brightly colored signage to create a new front door for both the Manufacturing, Technology and Engineering Center and the campus itself. The new addition creates a more unified campus with a connectivity of interior and exterior terraces for users to enjoy in the warm weather months. These green areas will facilitate the students’ and faculty’s interaction providing connections with nature and lead to increased cognitive function and wellness. 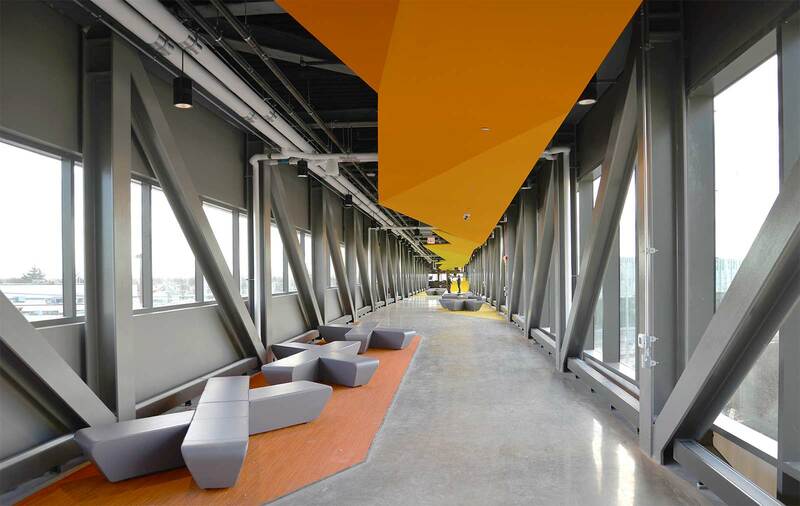 Additionally, the circulation spaces inside the building intentionally collide with seating areas, platforms, and alcoves to encourage students to congregate and participate in incidental learning between peers. This project speaks to issues larger than architecture; it is the embodiment of the community and seeks to revitalize the area by creating a connective dialogue that all are significant and welcome. This project also challenges the latent stereotypes of a community college and alters the psychology of simply crossing the street to go to class. Through dynamic spatial organizations and site-responsive architecture, the new building will not only be a catalyst for growth and change within Daley College, but the greater surrounding community.